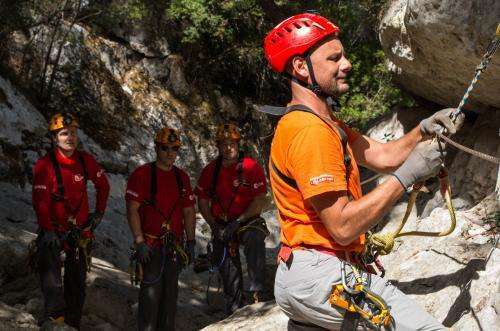 ESA's five 'cavenauts' and their instructors are set to explore the caves of Sardinia, Italy, where they will live and work during their six-day stay. 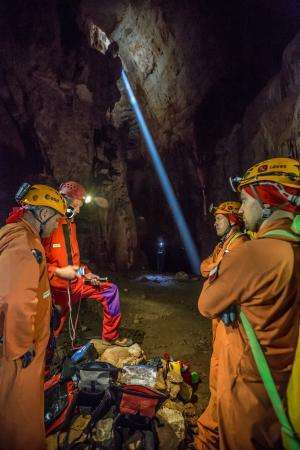 After a week of training above ground and in caves, ESA astronaut Luca Parmitano, NASA astronaut Scott Tingle, Roscosmos cosmonauts Alexander Misurkin and Sergey Kud-Sverchkov have begun their descent into the darkness to set up basecamp. They are joined by an experienced capcom from ESA's astronaut centre, Matthias Maurer, as an astronaut participant. The head of the European team that is the first point of contact with ESA astronauts in space, Antonio Fortunato, is acting as 'cavecom' on the surface. The CAVES course – Cooperative Adventure for Valuing and Exercising human behaviour and performance Skills – is designed to improve leadership, teamwork, decision-making and problem-solving skills. Just getting to basecamp some 200 m underground and a few hundred metres from the entrance will take up to five hours, with the team traversing rocks and pools in scenarios similar to spacewalks. To prepare, they received lessons in climbing, safety and operational briefings over the past week, checking equipment and receiving instructions for the experiments they will conduct. After walking a short distance, they will sleep tonight in a make-shift camp, before creating their basecamp this weekend for the rest of the stay. For Mathias, the underground stay offers a first-hand view of the team dynamics of astronauts in a new environment while working on scientific experiments far away from home – just like on the International Space Station: "One thing I never doubted was that our team would work together, but I soon realised that this group is made up of very determined and different people. "Each astronaut has specific preferences, objectives, likes and dislikes... so it will be interesting to see how we will all work together." Their time will be spent surveying uncharted areas, conducting biology experiments, looking for micro-organisms and testing new technologies. 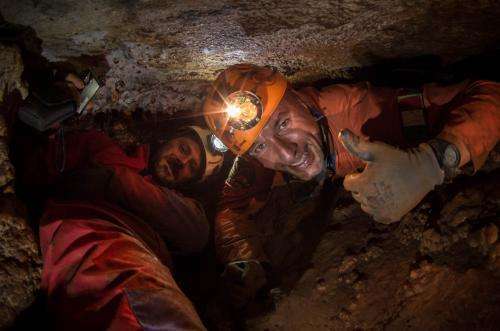 The sun is shining in Sardinia and it will take some time for the cavenauts to adapt to the impenetrable darkness and silence of the caves as theystartset off ontheir confined adventure.